This Bronze Age barrow was partly excavated in 1843 by F.R. Lukis. He dug into the mound and noted that it had been cut into by gravel quarrying immediately to the south of the barrow in the 19th century. This has created its unusual asymmetrical shape. Nevertheless he still found exposed bones and burnt material during his excavation. The mound is thought to be surrounded by a ditch that has now been infilled. The barrow is part of a cluster of Bronze Age barrows on Harpley Common. Bowl barrow 1150m east northeast of Crow Hall, Harpley Common. Adjoins Anmer to Rudham road. Around 9m (10 feet) high but badly disturbed and irregular may have been dug into or excavated and made up again. Numerous flakes. Adjoining on west are excavations for stone and gravel and it has been suggested that it may be an upcast from such workings, but I am of the strong opinion that this is not the case and the presence of flakes proves its proper origin. Two frags of yellow red Bronze Age pottery from rabbit burrow alongside. Probably the barrow No. 2 in (S1). Barrow contained flints and hard gravel. Mass of bones and burnt material exposed where cut by pit. 22m diameter, 3m high, steeper on south side. Now only 20m diameter, much damaged by plough especially on northeast, heavy rabbit infestation. D.A. Edwards (NAU), 18 May 1983. Undamaged until November when plough cut into it. Blocks placed around edge by HBMC but in 1989 mound rotovated within blocks 'for grassing over'. --- Aerial Photograph: TF7527 D; TF7528 B,E,F; TF7627 E,G,M-N,AA-AQ,AT-ABJ; TF7628 A,B,E; TF7727 B, D.
--- Monograph: Edwards, D.. 1976. 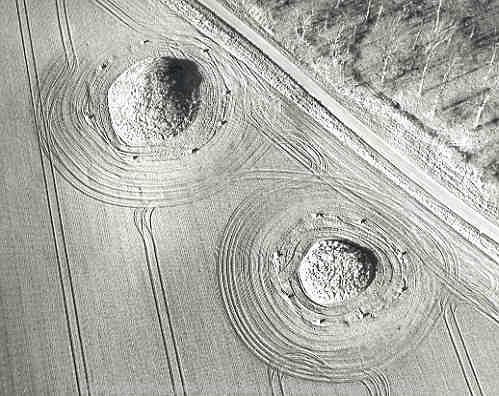 The Air Photographs Collection of the Norfolk Archaeological Unit.. East Anglian Archaeology. Vol II. --- Photograph: Edwards, D.. 1989. CXS 2, EME 1, EQF 7 to 10, EMV 4 to 5, EQG 8 to 12. Harpley Barrows..